May help improve breathing, clear phlegm, may help suppress pain. Lung cancer, oral cancer, nasopharyngeal carcinoma, laryngeal cancer, brain tumor. 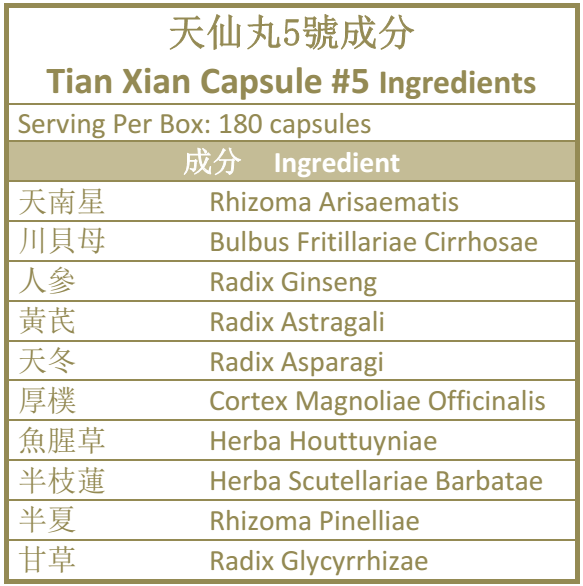 TIAN XIAN Capsule #5 is composed of Chinese herbal medicine for lung, trachea, bronchus, larynx, nasopharynx, etc. and is mainly used for respiratory system tumors. It may help strengthen the body resistance protecting the body from pathogenic factors. Radix Astragali seu Hedysari may improve the immune function of the body, and other components that may attack or restrain cancer cells of the respiratory system that may eliminate the tumor. This product also penetrates the blood-brain barrier, and may have significant effect on the cerebroma. Rhizoma Arisaematis may help eliminate dampness, phlegm and may stimulate gastric mucus, and may help reduce secretion of mucus. The water extract from Rhizoma Arisaematis may inhibit cancer cell, and may have protective effect on respiratory system and from brain tumors. For advanced lung cancer patients with infection, Herba Houttuyniae have detoxification, curb inflammation and other function that may help improve the patient. 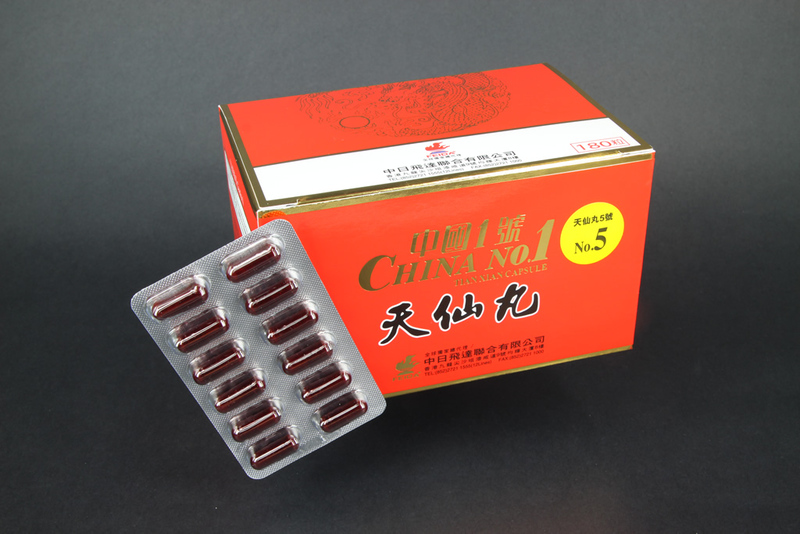 It may also have positive effect on lung, nasopharyngeal carcinoma, bronchogenic carcinoma, cancerous pleural effusion etc.